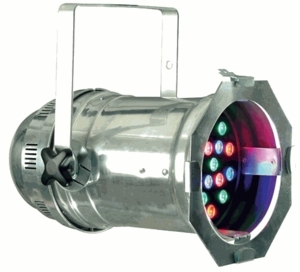 It�s 24 bright 1-Watt LEDs produces a high impact without the heat emissions of a traditional par can; thus entertainers will stay cooler on stage. With 50,000 hour rated reliable LED technology, the STAGE COLOR LED will need virtually no servicing and produces the highest quality of output without color fading. DIMENSIONS & WEIGHT: � PAR 64 CAN size � (LxWxH): 18.5� x 10.75� x 10� / 470x274x254 mm � 9 lbs. / 4 kgs.